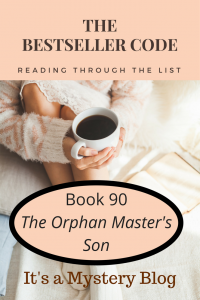 Time to start the discussion of our next novel from The Bestseller Code 100 list, The Orphan Master’s Son by Adam Johnson. This novel won the 2013 Pulitzer Prize for Fiction. What did you think of The Orphan Master’s Son? We’d love to hear your thoughts! Have you written about The Orphan Master’s Son? Feel free to add a link to your review here.